PROFIRE USA offers different versions of our 201 Concealed Handgun Course depending upon the permit desired. Colorado residents must have a permit issued in Colorado in order to carry in Colorado. This is because Colorado will only consider recognizing a permit from another state when it is carried by a resident of the issuing state. At present, the permit issued in Colorado is accepted is also accepted in 35 other states plus carry without a permit in Vermont. Our 201-CO course has been taught to thousands of students and it covers not only the basics such as handgun safety, defensive ammunition and shooting fundamentals but also selecting a defensive handgun, holsters, laws, use of deadly force, concealed carry restrictions and many other aspects. 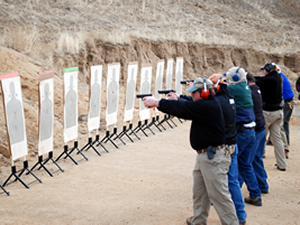 201-CO is a comprehensive course that goes far beyond the typical basic handgun safety course. Please understand that carrying a concealed handgun comes with huge responsibility. Unfortunately, many permit holders don't know that they don't know enough. Truly, nothing is obvious to the uninformed. Get real training from our professional firearms instructors for the same or even lower tuition in some cases. Need to renew your existing permit? If you have a concealed handgun permit issued in Colorado that is expiring and you need a new course certificate in order to renew it, we offer a special, shorter version of our 201-CO course. To attend our renewal course, the that you completed previously to obtain the permit must have included live-fire on the range. Where can I carry with the concealed handgun permit that is issued in Colorado? In Colorado the permit is issued at the county level only to Colorado residents only. Colorado residents MUST have a permit issued in Colorado in order to carry in Colorado (as of July 2007) which will not even consider accepting a permit from another state unless it is carried by a resident of the issuing state. The following map shows this Colorado permit "carry coverage" in green which is subject to change in a given state at any time without prior notice here. The permit issued in Colorado is valid for 5 years and may be renewed for additional 5-year periods new completion of a new handgun course may be required every 10 years. Vermont does not require a permit for carry there. How much does it cost to renew the concealed handgun permit issued in Colorado? The renewal cost may vary slightly from county to county but is generally in the $50 range give or take. Where are concealed handgun permit applications submitted in Colorado? In Denver and Broomfield, applications are taken by the Police Department. In all other counties, applications are made at the Sheriff's Office. All applications must be made in person and an appointment may be required in some counties. Each county may have a different procedure for accepting applications which is usually listed in detail in an information packet on their website. Got a question about permits? Click here for our additional FAQ page! Our 201 and 202 courses are among the courses that we offer which are non-NRA approved. Thus, by offering both NRA and non-NRA approved courses, our students benefit from having a wider spectrum of training options to fit their individual needs and interests. How much is the application fee for the concealed handgun permit issued in Colorado? The maximum fee amount is $152.50 which is $52.50 to the state and up to $100 to the county. Some counties charge less than the maximum. How long is the concealed handgun permit issued in Colorado valid? What is the best way to expand my carry coverage if I am a Colorado resident with a permit issued locally in my Colorado county? Unlike Colorado, some states will issue a concealed handgun permit to a non-resident. Some of these permits may be accepted in states when carried by a Colorado resident where the permit issued in Colorado is not accepted. For example, the permit issued in Colorado is not accepted in the state of Washington. However, the Utah permit is valid in Washington and can be issued to non-residents of Utah. Which "extra" concealed handgun permit is best if I am a Colorado resident with a local permit? Adding the Utah permit will expand your Colorado carry coverage by 2 states: WA & NV whereas adding the Florida permit will expand it by only 1 state: NV. The Florida non-resident permit costs $112 for the first 7 years and then $92 to renew for each subsequent 7 year period. Some training providers promote the Florida permit in addition to the Utah permit but this is unnecessary because of the complete overlap in coverage for NV and because the Utah permit costs much less. The Utah permit for non-residents costs $47 for the first 5 years and then $15 to renew for each additional 5-year period. Now, in order to apply for the Utah permit you must first have your permit issued first in your home state and you must complete a specific Utah approved handgun course which is available from us from $49. How can I get a permit that will allow me to carry in Nevada? If you don't want to travel to Nevada and take an approved course there then apply in the same county for a Nevada permit ($98.25 for the first 5 years and then $63.25 for each additional 5 year period), you can apply for the Utah permit as a non-resident. If you have a permit issued in Colorado, adding the Utah permit will expand your carry coverage by 2 states: WA & NV for an initial cost that is about the same as the cost of the NV permit alone without the required course in NV. Okay, what then are my concealed carry course options at PROFIRE USA? If you already have a CO permit, take our 201-UT course for $49 and then apply for the UT non-resident permit at a cost of $49 for a total of $98 to add Washington and Nevada to your carry coverage! If you don't have a CO permit yet, take our 201-CO and 201-UT courses and then apply for all both permits (CO + UT) for carry in up to 37 states! If you want only the permit issued in Colorado, take our 201-CO course. For courses with a range session, students may use their own handgun and ammunition or usually rent a handgun and purchase ammunition from the range. The minimum course of fire is 25 rounds. Colorado and Utah do not require a live-fire range session for their permits while it is required when applying for permits from certain other states. We offer both a live-fire and SIM-FIRE™ session with our 201 courses depending upon each student's experience level. Please call or use our contact form for more information.